BE A REGISTERED LICENSED PROFESSIONAL! One Dream and Mission for the future of the OFWs in Kuwait, the organization aspires to fulfill dreams of Filipino Professionals in Kuwait. 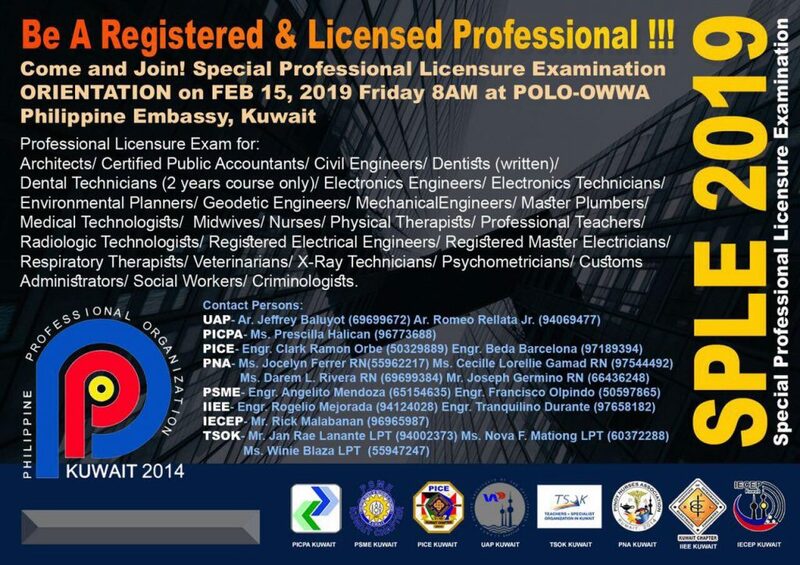 Professional Licensure Examination application for the above-mentioned profession is now open to all kabayan in Kuwait. Interested applicants/examinees are required to file their application and submit required documents; please contact the person concern. 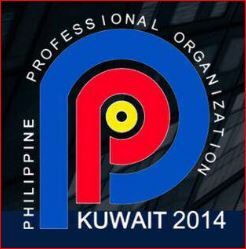 As an OFW Advocate, co- founder of Teachers Specialist Organization in Kuwait TSOK and sincerely supporting Philippine Professional Organization PPO Kuwait, as my advocacy. We highly encourage all applicants to apply before the deadline to ensure the availability of slots for appointment date of application. There will be NO request for extension will be entertained upon deadline for submission. 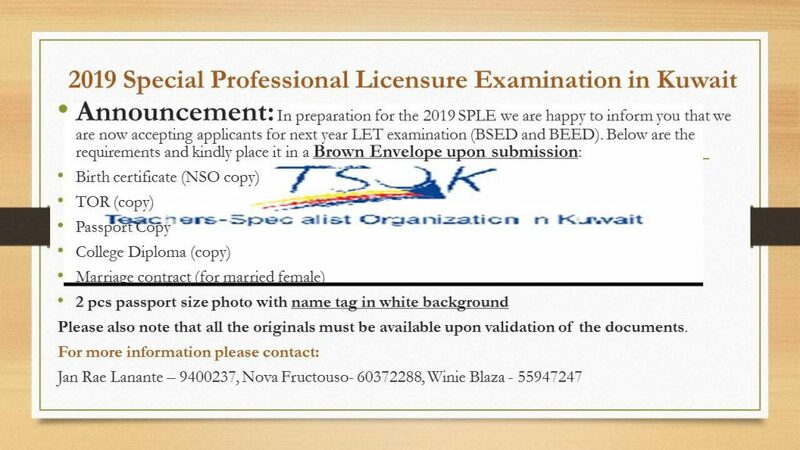 Special Professional Licensure Examinations (SPLE) is doable, trust the previous passers and our PHILIPPINE PROFESSIONAL ORGANIZATION team… they have proven this many times. Kayang-kaya po! 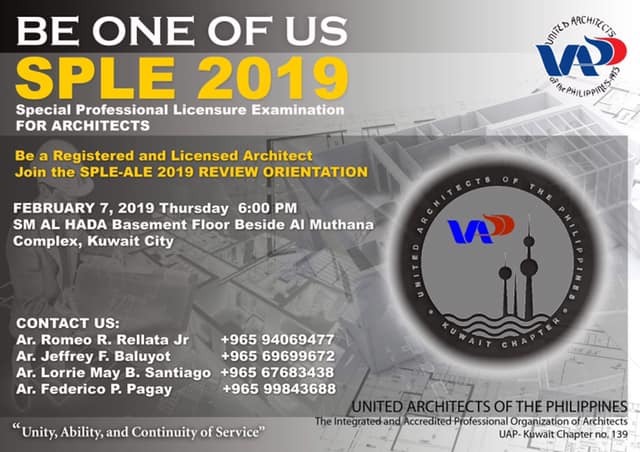 Again, any queries and questions thereof concerning the SPLE in Kuwait by the OFWs shall be addressed to the contact persons in each discipline. Successful organizations use their people’s best leadership and PPO incredibly powerful at engaging tomorrow’s leaders. Most important service is connecting in a very real and meaningful way with kababayans. Hope this can help you. Sending my Good luck and may God bless each of you upon taking the exam. If you like this article please share and keep posted at Diarynigracia Page. 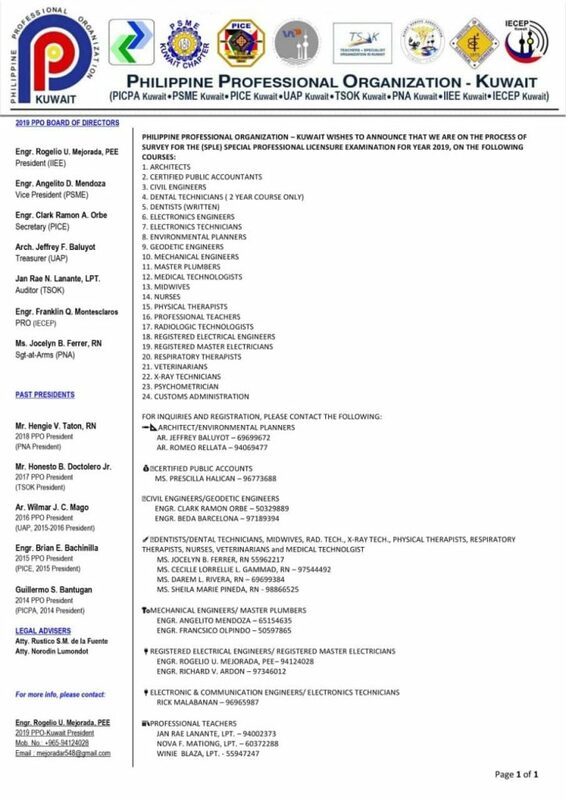 Please see attached for the contact details of each Accredited Professional Organization for any inquiries on the upcoming 2019 SPLE. And also, to all proactive past and present PPO. NEWBIE IN STOCK MARKET, what to do?